I'm going to apologize for my lack of frequency in posts this week. I have been very busy working on client projects, getting orders placed, and finishing up some construction work at my own house. Not to mention getting ready for Easter! Anyways, throughout the week I've been snacking on these delicious and beautiful cookies that were sent to me by a client. Seriously have you seen a more perfect cookie? Eat you heart out Elini's (New York) & Beckers (Manhattan Beach) these taste much better and are just as if not more detailed! 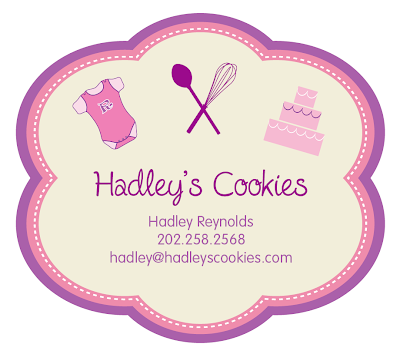 Now Hadley is not only the person who sent me the cookies, but she is also the owner of Hadley's Cookies! I helped her design her son's new bedding and she sent me these as a thank you. It is funny that I had no idea that she has this business until I received these cookies. 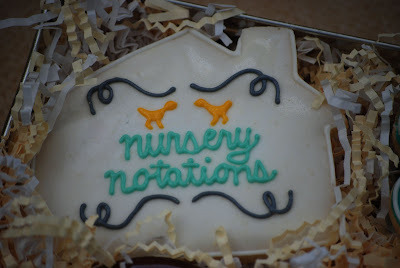 My favorite is of course the Nursery Notations logo cookie, my son's is the monkey and my nieces like the dragon fly and flower. She can make a cookie in just about any shape and color combo. Here are some adorable ones perfect as baby shower favors or as a "congrats" gift for new parents. She can ship anywhere in the United States. Hadley shipped mine from New York all the way to Los Angeles and they arrived in perfect condition in a silver tin. To keep them fresh for random snacking, I popped them in the freezer. 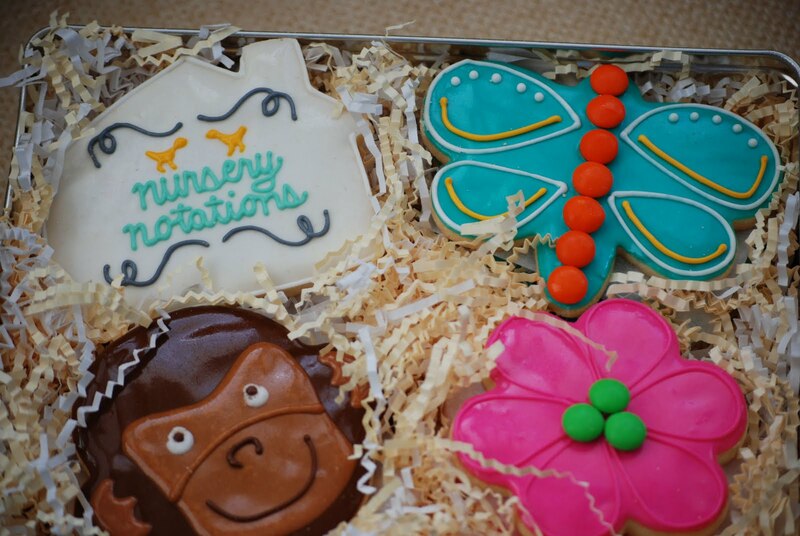 To see more examples or place your own order as a gift or for a special event visit her website Hadley's Cookies. Thanks again for the wonderful surprise! My whole family thanks you! Gramercy Gals love Hadley's Cookies too!